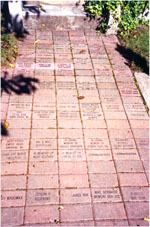 A successful fundraiser that begun in 1994, the Silk Walk is a project designed to sell engraved bricks for placement at the Landmark's front walkway, und under its grape arbor. Funds from the project are used for the Museum's upkeep, operating expenses and educational and educational programs. This ongoing project is available for all to participate. Silk Walk bricks are priced from $50 to $200. Each year, trained apprentices schooled at the International Masonry Institute of Bordentown, New Jersey install the bricks. Members of the Masons Union Local 4 & 5 will partcipate in this years installation. Buy a brick, engraved with your name or personal message on the Museum's Silk Walk Buy it for yourself, someone you know, or as a memorial for a deceased loved one. When you buy a brick on the Silk Walk you become part of the Botto House National Landmark vibrant new image. Your personal message becomes a lasting gift and a piece of history along the Silk Walk. Messages to be engraved on 8x4inch (front sidewalk) or 6x9inch (VIP - under grape arbor) bricks. 3 lines maximum, 13 spaces per line. 8x4 inch bricks: One Line: $50. Two Lines: $75. Three Lines: $100. VIP bricks: One Line $150. Two Lines: $175 Three Lines: $200. Fill out the order form and return it with your payment to the American Labor Museum.